Turk’s Head Brewery is now open for tours. I think he’d be surprised at the current attraction of craft beers, tours of the breweries that make them, and tasting rooms that have taken on the aura of a science lab. He’d be even more surprised to learn there is now such an operation in the Turks & Caicos Islands. Since 2001, the Turk’s Head Brewery has been operating in a group of large warehouses in the industrial area of Providenciales, just east of the Five Cays “shortcut” off Leeward Highway. Our storage locker is just behind the brewery, and its presence finally explains the mysterious, heady aroma I often smelled while unloading magazines. The brewery is part of Provo Beverages, along with the TC Crystal Pure Water company, and in spite of refilling my plastic gallons there every day, I never knew that beer was being brewed in the back. 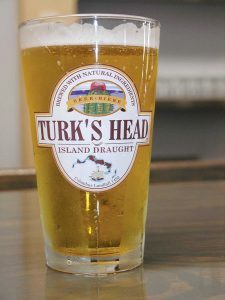 Turk’s Head Lager is the “quintessential refreshing beer” of the Islands. Currently, Turk’s Head Brewery makes lager, amber ale, IPA and light versions of Turk’s Head Beer. You can find the products sold in most grocery and liquor stores in the Islands, and served—either bottled or on tap—at most restaurants and bars. The lager is the best seller, described as “the quintessential refreshing beer,” a staple for a hot, sunny beach day, and somewhat similar to Corona. The amber ale is more full-bodied, while the India Pale Ale emits fruity aromas of papaya (I vouch for that! ), with a tastebud-tickling touch of bitterness. Besides being the country’s most affordable beer, visitors and locals love to support this genuine product of the Turks & Caicos Islands. For many tourists, their only complaint is that it is not currently sold off-island. The brewery’s unique mobile bar is a staple at the popular Thursday Night Fish Fry, as well as most Providenciales sporting and charity events. Just prior to opening to the public, Sales & Marketing Representative Mike Bozzer led me on a private tour of the brewery. Besides being fascinating (I, like many, am a devotee of “How It’s Made”), the tour revealed a spotless, professional plant complete with catwalks and a brand-new tasting room overlooking the bottling area. 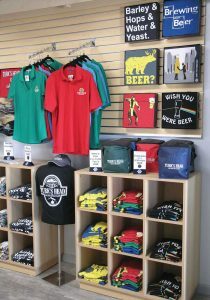 Here, visitors can sample each of the various draughts and purchase very cool Turk’s Head merchandise—t-shirts, caps, bottle openers, glasses, bar towels, and the like—to take home as souvenirs. Tours of the Turk’s Head Brewery are now available. The brewing process begins with ultra-refined desalinated water (made on-site at the water plant), barley imported by the container-load from Minnesota, Germany and elsewhere, and hops shipped in from places as far-ranging as New Zealand and the Pacific Northwest. Mike explained that the first step is converting the natural starch in the malted grain to sugar, done by soaking the barley in warm water to release the enzymes, then boiling this sugar water in a kettle to concentrate the sugar and sterilize and purify the “wort.” Next, the hops are added, with amount and timing Brewmaster Eric Cardin’s calls depending on the type of beer being brewed. The mixture is then sent through a heat exchanger to rapidly chill, before being put in glycol-jacketed fermenters with yeasts added to convert the sugar to alcohol. The mixture is allowed to ferment and age for as long as several weeks, depending on the beer type. Generally, the more sugars in the wort, the stronger the concentration of alcohol. Finally, the beer is carefully filtered to ensure a clean, crisp product. Following filtration, it is either bottled, canned or kegged, each date-stamped to ensure freshness. Random bottles are regularly tested to maintain the product’s integrity. From there, the product is packaged and distributed across the Turks & Caicos Islands. Although there is a four-month shelf life, Mike says rarely does the beer remain in its container for that long! Operating at capacity, in 2016 the brewery produced the equivalent of two million bottles of beer. Employing 25 to 30 people, the locally owned Turk’s Head Brewery can be said to be the country’s largest industrial producer, and quite a success story. 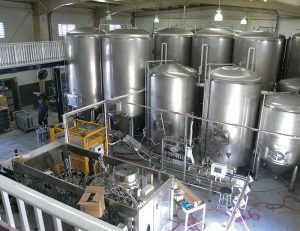 The original plant started with a ten barrel system and sold only kegs to a few restaurants and hotels; since mid-2013 twelve 80-barrel fermenters (each holding about 1,000 cases of beer) are producing millions of dollars worth of product, and the new beers have entered the high-end market. The brewery/water plant also markets two other refreshing drinks: Bambashay Caicos Cran (a vodka-cranberry cocktail) and the popular Bambarra Cuba Libre (a classic version of rum and cola), both available in cans to easily take to the beach or on boats. A variety of Turk’s Head Brewery souvenirs are available in the tasting room. The tour and tasting room opened in February 2017. One-hour tours are offered several times daily, six days a week. Besides sampling the six current products, visitors may also have the chance to try the brewmaster’s specials—one-of-a-kind stouts, pilsners, and wheat beers being tested for sale at select restaurants or as potential new offerings. The tasting room is also available for rental for special events like bachelor or birthday parties. Just like its sister company TC Crystal, the Turk’s Head Brewery is heavily involved in the community. Besides sponsoring numerous environmental events and a recent 10K race for the Delano Williams Foundation, all proceeds of the mobile bar at sailing regattas sponsored by the Provo Sailing Club are donated back to the organization. They also sponsor the Turk’s Head All Fleet National Sailing Championships. TC Crystal bottles water in 63% biodegradable bottles, and regularly sponsors beach clean-ups, school promotions, and has donated dozens of garbage drums to help keep the Islands clean. That in itself deserves a toast! For more information, call 649 241-4311 or email tours@turksheadbeer.com.